He is like a berserk Bugs Bunny. He's like a crazed rabbit, his nose twitching as he lies, exaggerates, conjures up hidden agendas and conspiracies, twists and turns. He is a nattering nabob of negativism. Today on UpAlong - Happy Friday! 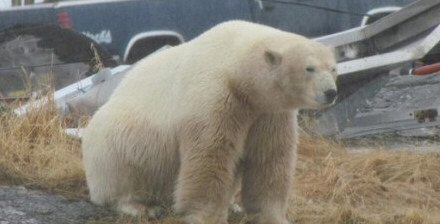 A polar bear that wandered into town had to be shot by police. RCMP said that they watched the animal drift into the harbour on the ice yesterday around 5:00 pm. They thought the bear would have continued on north, but it came into the housing area, crossed the road and went up by a garage and lay down. The decision to shoot the bear was made by wildlife for safety reasons. An unrelated announcement was made latter in the day that there will be a Mystery Meat Potluck and Time at the Legion this Friday night. Hang on to any Newfoundland quarters. If you have them, they may be worth much more than 25 cents. "We are recalling all the new Newfoundland quarters that were recently issued," Canadian Mint Deputy Minister Jack Shackleford said Monday. "This action is being taken after numerous reports that new quarters will not work in parking meters, toll booths, vending machines, pay phones, or other coin-operated devices." The quarters were issued in the order in which the various provinces joined Confederation. and have been a tremendous success among coin collectors worldwide. "The problem lies in the unique design of the Newfoundland quarter, which was created by a team of mainlanders. ", Shackleford said. "Apparently, the duct tape holding the two dimes and the nickel together keeps jamming the coin-operated devices. They grew up with it; they rode the Marine Atlantic ferries in it; they even sang about it; and today they held a press conference to tell the world that they have finally caught the wind. "Well, it happened like this", said Con O�Brien, "we were down on the waterfront, walking along, enjoying the day, when we see this gust coming towards us from across the harbour... looked like a Southside Squall." He continued, "Duncan pointed out that one of the docked fishing boats had a pail and cover sitting next to it on the dock and shouted for Graham and Rob to go grab it and stand ready." "Next thing we knew, the byes were head into the squall and fighting to stay upright. That's when Duncan rushed over and managed to get it into the pale - and the byes fastened the cover down." Mr. O'Brien then produced the 5 gallon salt beef bucket for the press to inspect. UpAlong.org's local reporter, Buddy, got a chance to touch the bucket. "She was vibrating sometin fearse, ole man... like dey had put in a hive of bees. Dat Southside Squall dey captured sure don't like to be locked up. ", Buddy said. The Irish Descendants plan to take the squall out to sea and release it. On a slightly related story; the harbour has been enjoying a flat-calm ever since the Irish Descendants captured the wind. Remember when this happened in Nov of 2008? Newfoundland and Labrador will not receive equalization payments for the first time in the 51-year history of the program. The Finance Minister made the announcement recently in Ottawa. Newfoundland joines B.C., Alberta and Saskatchewan in the new class of so-called "have" provinces. Meanwhile, Ontario will dip below the equalization threshold for the first time next year. Premier Danny Williams called it a proud day for Newfoundlanders and Labradorians. Reaching the equalization threshold has been a symbolic goal of the provincial government ever since Premier Brian Peckford made his famous "someday the sun will shine, and have-not will be no more" speech in 1982. Outport dart player Tom Clayton announced at the Hotel Newfoundland that he was joining the Canadian Pro Dart circuit, effective immediately, if not, sooner. After 20 some-odd years of carrying his various teams to victories of home-made knitted socks and frozen turkeys, Tom figured that his skills are on par, if not more so, with the pro�s. Some of Tom�s old team-mates are excited that he has finally decided to turn pro. We here at UpAlong.org wish Tom all the best. A passenger in a Gullivers taxi tapped the driver on the shoulder to ask him something. The driver screamed, lost control of the cab, nearly hit a bus, drove up over the curb, and stopped just inches from a large plate glass window.